415 pages | 133 B/W Illus. 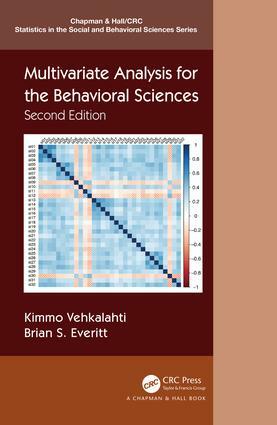 Multivariate Analysis for the Behavioral Sciences, Second Edition is designed to show how a variety of statistical methods can be used to analyse data collected by psychologists and other behavioral scientists. Assuming some familiarity with introductory statistics, the book begins by briefly describing a variety of study designs used in the behavioral sciences, and the concept of models for data analysis. The contentious issues of p-values and confidence intervals are also discussed in the introductory chapter. After describing graphical methods, the book covers regression methods, including simple linear regression, multiple regression, locally weighted regression, generalized linear models, logistic regression, and survival analysis. There are further chapters covering longitudinal data and missing values, before the last seven chapters deal with multivariate analysis, including principal components analysis, factor analysis, multidimensional scaling, correspondence analysis, and cluster analysis. Clarity and conciseness have always been the hallmarks of Everitt’s writing. This book is no exception. Anyone looking for a clearly written text on the subject that is also practitioner oriented needs to look no further. … The first two chapters give a magnificent introduction before approaching the modeling issues. Especially the second chapter, which shows how to look at data, is among the best I have ever seen in books on multivariate methods. … He also goes well beyond the typical graphs showing how to explore real insights of the data. … the book is extremely easy to browse and read. … Putting the R code in an appendix and on the website is an excellent choice. … the huge experience of the author … makes the presentation so clear and understandable. I’ll be happy to recommend this book to students and researchers. Kimmo Vehkalahti is a fellow of the Teachers’ Academy, University of Helsinki, Finland. He has been a part of the faculty of Social Sciences for over 25 years, currently as senior lecturer of the Social Data Science in the Centre for Research Methods. He is author of a Finnish textbook on measurement and survey methods. The present book is his first international textbook on statistics. His research and teaching activities are related to open data science, multivariate analysis, and introductory statistics. His spare time is divided (unequally) between jogging and trail running, reading, watching ice hockey, holidays with his wife, and singing tenor in choir. Brian S. Everitt is professor emeritus, King’s College, London, UK. He worked at the Institute of Psychiatry, University of London for over 35 years, finally as head of the Biostatistics and Computing Department and professor of behavioural statistics. He is author or co-author of over 70 books on statistics and approximately 100 papers and other articles, and was a section editor for the Encyclopedia of Biostatistics, published by Wiley. In retirement, he divides his time between working as editor-in-chief of Statistical Methods in Medical Research, playing tennis, watching cricket, long walking holidays with his wife, and playing classical guitar in private.